A stalwart of the Diageo Special Release series, the unpeated Caol Ila offerings are always amongst the most anticipated whiskies of the year for fans of the Islay Distillery. Caol Ila is known for producing spirit with a distinctive grassy peatiness, but this version removes this powerful smoke, to showcases the spirit in a different light entirely. This year, the whisky has been aged in former Sherry butts, “rejuvenated” and refill American-oak hogsheads for 15 years. The result is a perfectly balanced whisky that demonstrates the qualities of both the varieties of cask, with subtle notes of vanilla, orchard fruit, toffee, bright oak and cake from the American oak. The European oak imparts richer notes of dried fruit, sherry, dark oak and a faint zing of mint. The whisky is also possesses a very, very faint touch of smoke, no doubt a result of equipment used to distill the spirit is the same that makes Caol Ila usual smoky whisky. 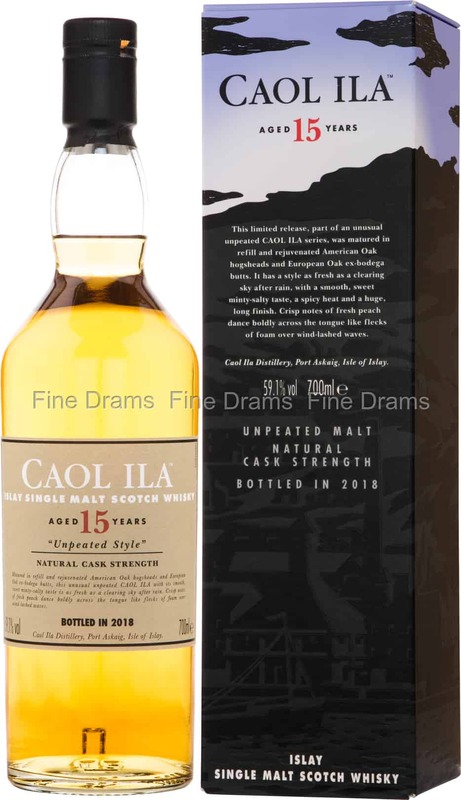 Caol Ila 15 Unpeated is bottled at 59.1%, and without chill filtration or artificial colouration, ensuring a dram full of dense flavours and thick mouthfeel. A stellar addition to this excellent series from Diageo.